What's not to love about slingshotting squids around a map via their tentacles? How about dressing them up in ridiculous little costumes? 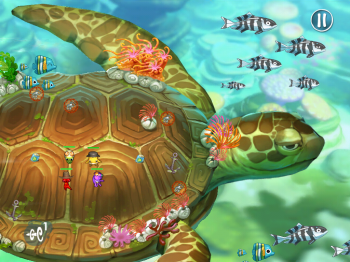 What do you get when you combine sea creatures, costumes, and turn-based combat? Give up? Why, you get Squids, a new game that's quite possibly the goofiest, most adorable thing you've seen in a while for iOS devices, Mac, and PC. The story here revolves around a team of squids who happen to be a bunch of treasure hunters (a la Indiana Jones). Apparently, during a treasure run, some sort of ooze winds up getting into the ocean waters and coating various sea creatures, who start acting aggressive towards other squids. As a result, it's up to players to rally the troops and lead a group of squids to save their civilization. The simplest way to describe Squids is that it's like a top-down version of Final Fantasy Tactics mixed with Angry Birds and style elements from The Little Mermaid. In order to move a player's squad members around the map, each squid's tentacles needs to be drawn back - like a slingshot - and they are then launched in the corresponding direction. 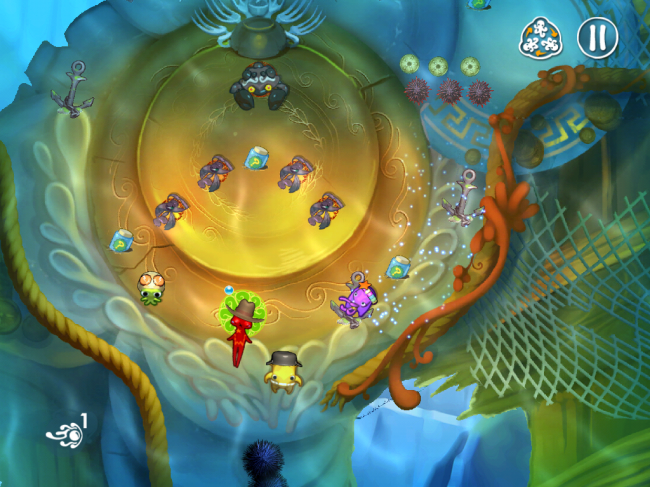 The more powerful a movement shot is, the more action points (represented as bubbles) are used up in a turn. Essentially, the game employs a mixture of turn-based and real-time combat. Players only have so many action points to use with their team members each turn. While it's possible to do some damage to an enemy by simply slamming a squid into them, each little cephalopod has a unique ability or attack they can employ. A few examples include the ability to make special dash attacks, ranged pistol attacks, area attacks, and healing abilities. Several of these abilities have to be triggered while the squids are moving; this is where the real-time combat takes effect. The environment, too, can provide hazards and/or help, depending on how one plays. 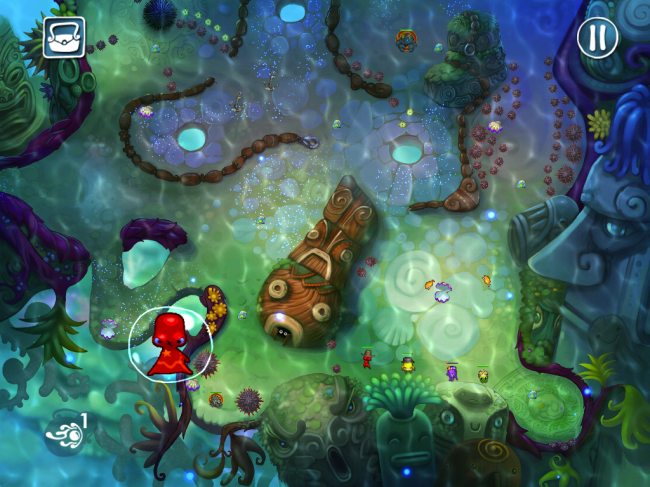 Scattered throughout each level are currents that will move anything they touch. This can be useful, because they can move squids further than they normally would be able to, or an enemy can be knocked into a current and then subsequently slammed into a spiked urchin that will harm them a lot more. As it turns out, The Game Bakers is a studio that was created by a number of veterans from Ubisoft. As a result, the group is aiming to "bring what we know about the console industry and combine it with the best elements of the iPhone and iPad." 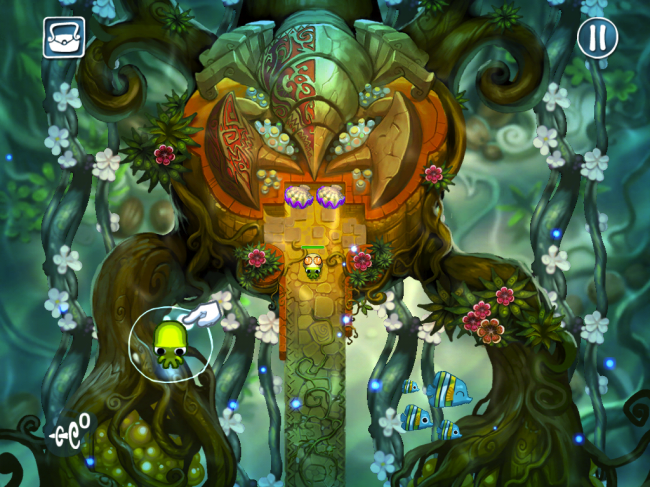 Based in France, the group realized early on that the main problem with many iOS games is that they become pretty repetitive way too quickly. As a result, the developers have gone to pretty great lengths to ensure that Squids doesn't suffer from this problem; based on what I got to play, it seems like they were pretty successful. When I asked how long the main campaign will last, I was told it will take players approximately six to eight hours to play through. The maps are pretty varied, both in terms of layout and size. The first map on display was relatively small and only took about ten minutes or so to complete. The next level, however, was sufficiently larger and would easily take twenty-to-thirty minutes to complete. Visually, Squids is stunning. Seriously, the graphics look lovely and hand-drawn, and the squids themselves are all unique, goofy, and adorable. Each squid can be kitted out with different items and pieces of clothing that will enhance their abilities and attacks; all of which can be purchased from the in-game store with pearls collected in each level. Pearls are where microtransactions will come into play: While players can earn pearls via gameplay, they can also spend real money on them in order to buy expensive items without having to replay levels. However, a player doesn't have to buy pearls: it's entirely possible to take the slow and steady route, earn pearls, and (eventually) they will have access to every item within the game. 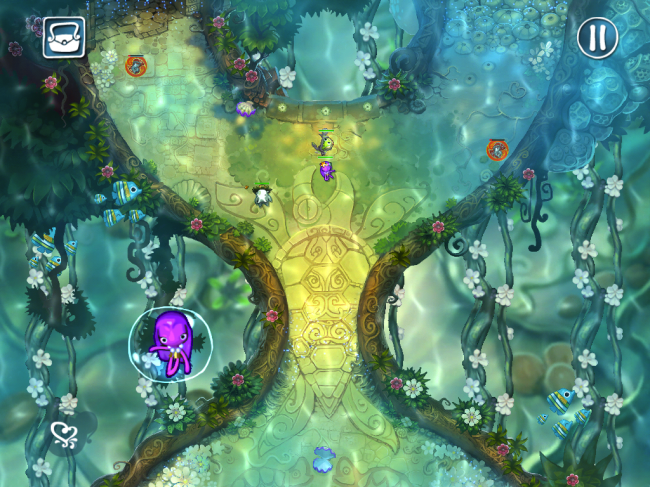 At the moment, Squids is due out for the iPhone in October. The iPad version (with a bonus local competitive mode included) will follow soon after that. The game is also planned for an eventual releases for PC, Mac, and Android, but The Game Bakers didn't have a definite date for those versions yet.